Is that evil Oliver or someone else? 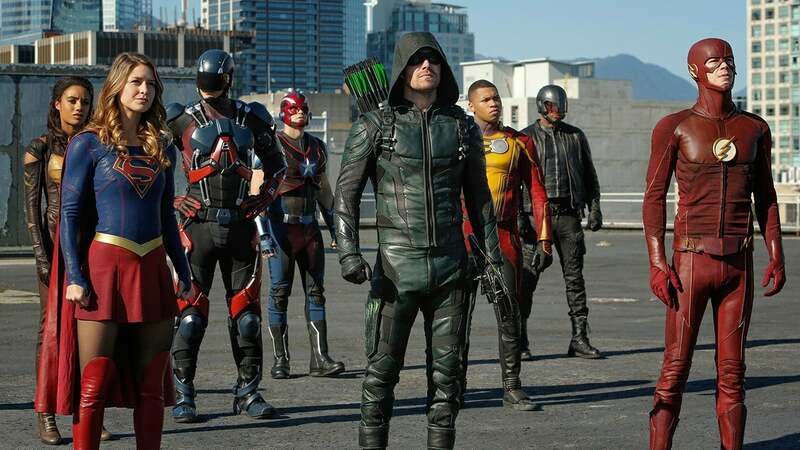 The first footage from the upcoming “Crisis on Earth-X” Arrowverse crossover event is here and in it, heroes from all four of The CW’s DC shows unite to stop a Nazi threat. We even get to see what look like modern-day Nazi soldiers that are probably invading Earth-1. The 8-second promo for the upcoming crossover began airing on The CW on Monday. It opens on what are unmistakably modern Nazi soldiers in black armor before we see a core group of DC heroes: Alex Danvers, The Clash, Green Arrow, Supergirl, and White Canary. Then we see Supergirl making a fist, some dark archer pulling an arrow out of his quiver, and a female with white hair — presumably White Canary — fighting one of the Nazi soldiers. The CW's comic book-style cover art for the crossover event features all of the characters. In “Crisis on Earth-X,” the many characters from across the Arrowverse unite in Central City for Iris and Barry’s wedding, but the event gets crashed by some villains from Earth-X. On that world, the Nazis won World War II, and many of the same DC heroes are villains as a result. We’ll see an evil Supergirl and an evil version of The Flash that looks a lot like the Reverse-Flash, but that’s only the beginning. Based on the above image, it looks like Earth-X gets two evil archers, both clad in black. So the archer we see in the new promo could be the Nazi Oliver Queen or it could even be Prometheus, who died on Arrow at the end of last season and is confirmed as part of the crossover. “Crisis on Earth-X” runs on The CW for four hours total on November 27 and 28, spanning across all four of its DC shows.